Rey & Kiyomi Ortega are back again this year to help put on the second annual Children's Circus, and work with the kids in the performing arts. Kiyomi and Rey are the creators and performers of the Wisdom Tree Program, a Native American story-telling program which they present in schools and museums around the U.S. They bring tremendous talent, and a great energy to the library's summer program, we are very lucky to have them volunteer their skills and time! Rey will be performing his Bamboo flute and Mayan music presentation at Lol Ha on Thursdays from 6-7 PM (starting 7/30). Proceeds to benefit the library, don't miss it!! We are also thrilled to be hosting two volunteer teachers, Becky Glenn, and her daughter, Audra. Becky teaches ESL and Spanish at colleges in Illinois and just finished her Master's degree in Education focusing on second language acquisition (and we mean just, she had her oral exams just weeks before departing to Akumal, congratulations Becky!). 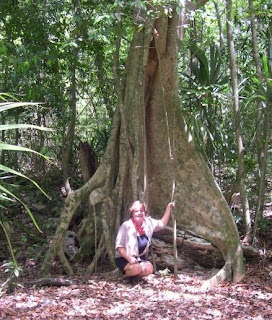 Becky also speaks some Yucatec Mayan and is very happy to have the chance to practice with native speakers in Akumal. Becky has 3 kids, and in her spare time also likes to paint murals! Audra just finished her sophomore year of college where she is majoring in social work, and has worked at various children's summer camps in the past with a special ability in working with children who have experienced major illness or trauma. Both Becky & Audra have brought their many skills and enthusiasm about being in Akumal to the library's summer school program. Becky says, "We love the food, the beach, the people of Akumal and are having a wonderful time!" 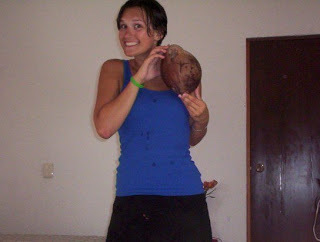 Audra is excited to be able to pick her own coconut!